I was excited to learn a few months back that 12 of my photographs had entered the San Francisco Museum of Modern Art (SFMOMA) permanent collection. The images from both the fairground series, and more recent work on the Mississippi river towns of Wisconsin and Minnesota, were originally part of the Bruce and Nancy Berman collection and were a gift to the museum. I was in the Bay area last week and paid a visit to the new home for some of my favorite photographs, and was humbled to see that they will be in good company. There are currently two exhibits at the museum. Both contain some truly great photographs by some of my favorite photographers. The first exhibit 75 Years Looking Forward features an overview of the SFMOMA collection, as well as a look at some of the exhibits and directions the museum has gone in the past 75 years. It was good to see a modern museum willing to look back, and particularly interesting to have it acknowledge its history as a design museum as well. Outside of MOMA in NY, most contemporary art museums ignore the rich history of design they displayed once upon a time (I mean you WAC). The display of portable Olivetti typewriters was particularly touching given the area's history of killing off the once ubiquitous writing instrument. A room full of anonymous photographs and the history of wooden chairs was also an interesting stop along the way. But what was particularly good news was to see photography given its full credit by being intermixed with the paintings and sculptures. 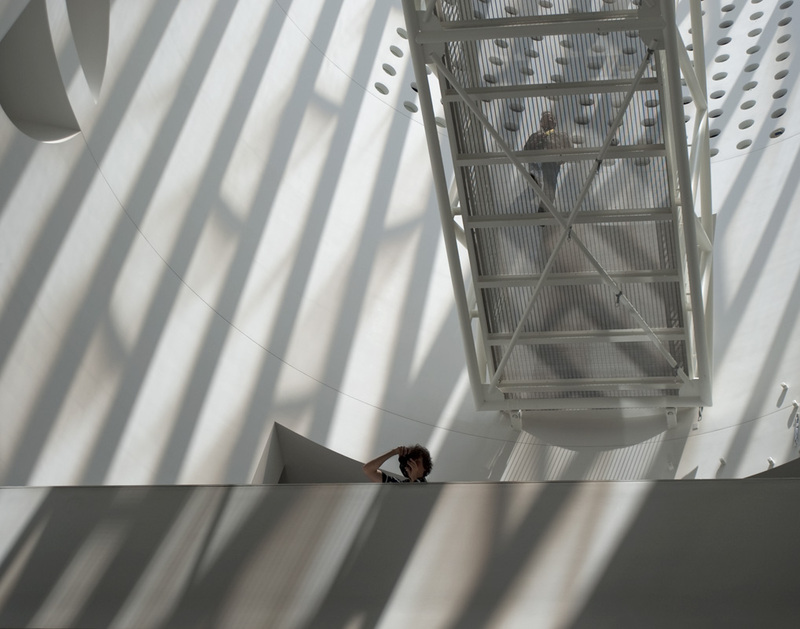 At last a contemporary museum that understands photography's place in the art world! Something that one can not find very often here in the midwest. But wait, that is not all! The history of California photography was also featured in the exhibit The View From Here. It has long been obvious that CA has played a major role in the 20th century development of the medium. But I have admit that I was still surprised at how often I came across images that I showed in the classroom, when I taught photography history as part of darkroom photo courses. Sure there was Adams, Weston, Cunningham and Lange and the usual suspects. But the 13 print panorama by Eadweard Muybridge of SF in 1878 held up every bit as well as anything done in the 130+ years since. The final room featured work from the past decade, and I have to admit the one digital camera image in the show did lack something besides film grain. I think digital is still in its early stages and it might be a while before it can excite us as much as an albumen print from a glass negative by a master like Muybridge. Of course I post here a digital camera shot of a photographer on the upper floors looking down on the lobby. It truly is a wonderful museum. I can not wait to go back. Photography Copyright � David Husom 2010. All rights reserved. Click to see larger. In 1984 we spent about a year living in the town of Shimoda Japan. Located about 3 hours from Tokyo, the town is a well known hot spring spa and beach resort area, but also a rice farming and fishing village. At the time it also had a very active shipyards. I spent almost every day photographing the town and the countryside around Shimoda. Being away from major cities and professional photo labs I decided to primarily work in black and white, although I had been working exclusively in color for about seven years at that point. But like my earlier color work I used a 4X5 Sinar camera for all of my photography. I processed the film and made contact prints while in Japan and larger fiber based prints back at our studio, then located in St. Paul. I had a show of the images in 1985 at Film in the Cities in St. Paul Minnesota with Stephen Shore (his of course were his American images and were color photographs) and a show in Japan later that same year with my wife Ann-Marie Rose, hers being hand colored black and white and shot with an 8X10 camera. 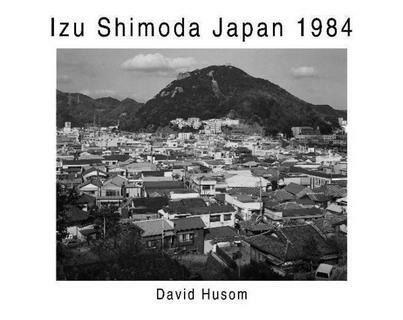 Izu Shimoda 1984 Book by David Husom You can preview all 25 photographs here as well as order a copy of the book. 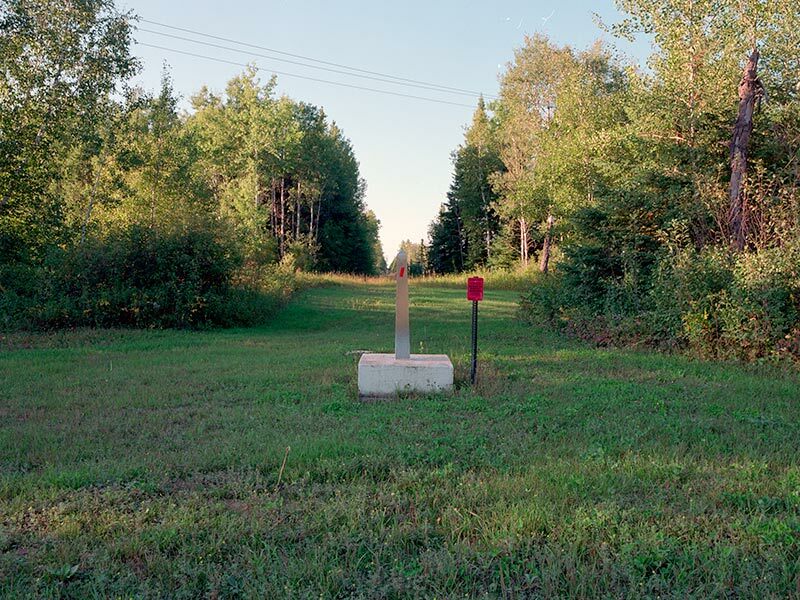 Minnesota has a small bump at the top where the US - Canadian border extends beyond the normal 48th parallel that divides the two countries. This is due to a 19th Century dispute over where the true source of the Mississippi was and the fact that the US wanted access to Lake of the Woods. It is the most northern point in the lower 48 (contiguous) states. To get here you leave the US in Roseau MN and drive through Canada for about an hour. When you cross from Canada back into Minnesota along the dirt road that leads into the Northwest Angle here is the border maker. Note the cut in the trees running north behind the marker showing the border. (Don't forget to check back in with US Customs at one of the remote border stations via video phone). Click on the image to see a larger version. Photograph Copyright David Husom 2009 All rights reserved. Once you get to the town of Angle Inlet (to call it a town is a stretch�but it does contain a post office and a store), you find about a half a dozen resorts. 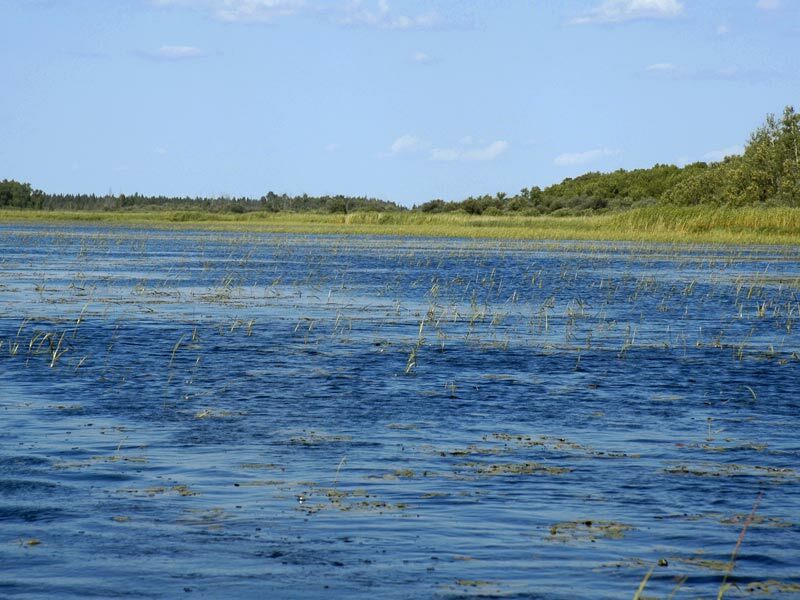 Drop your boar into Lake of the Woods at any of the boat ramps and head back west to the point where the inlet becomes an unnamed creek and you are at the true most northern point of Minnesota and the contiguous states. From out in the water looking back south at the border you see the clear cut line that runs the length of the US-Canadian border in the Northwest Angle. To the right is Manitoba, to the left is Minnsota. Here is the actual spot or tripoint where Minnesota, Manitoba and Ontario Canada meet. 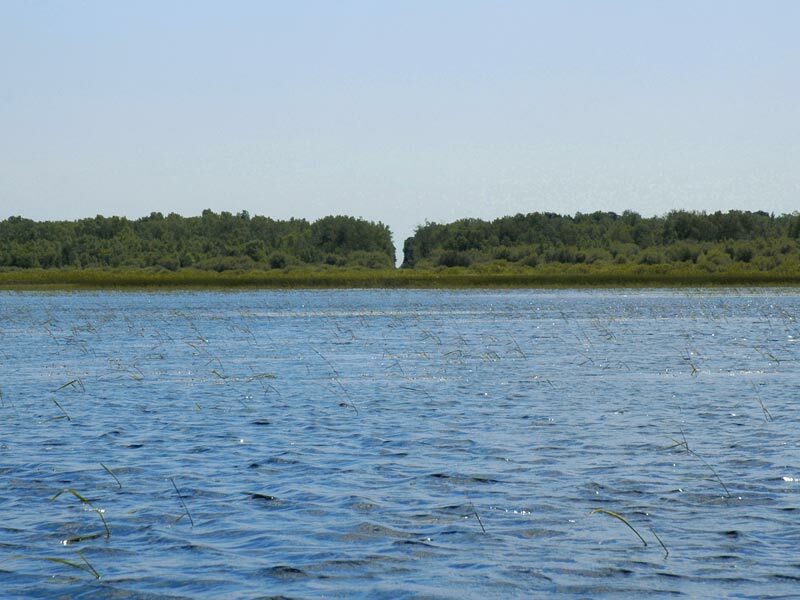 The exact spot is under water, but there have been markers nearby on the land at various times. Even in high water it is very shallow and weedy here. But according to our GPS, this is the point. Turning back around the clear cut in the tres (above) is very obvious. For such an important point, it is all very insignificant looking. But it is a spot we do like to visit every few years. If nothing else it is a bit of a challenge to get here. Our studio will once again be part of the Mississippi River valley fine art tour. 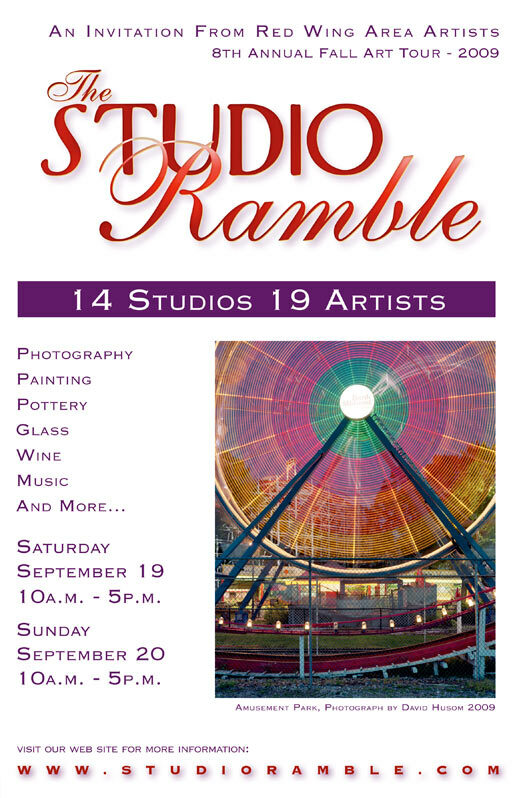 Called the Studio Ramble, this is the 8th year for the tour. I will have some new work and some new projects to show. If you missed the Anderson Center show American Heartland last winter much of that work on display. My co-exhibitor Bill Rodman from that show will be showing his work here at our studio as well. Stop by on Sept 19th or 20th between 10:00 and 5:00. This years poster and brochure features one of my recent photographs from Arnold's Amusement Park in Okoboji IA. Click on the image on the left to see a larger version. Helping Pick Minnesota�s 10 Most Endangered Buildings. It was actually a much more serious and engaging day than I would have expected. Although each of the possible structures had gone through a fairly rigourous nomination process we had to weigh each one carefully to decide not just the worthiness of the entry, but also possible benefits from listing, and if the structure or similar ones had been listed recently. In the end we each picked one building or structure to write up a description of for press releases and the Web. Of course I could not pass up the chance to work on the wonderful fish shaped building in Bena MN. Featured in a number of books on roadside Americana and in the introduction to the Chevy Chase movie National Lampoon Vacation it is certainly a structure worth preservation. Let�s hope that the nomination encourages the owner, town and the powers that be to help keep this wonderful landmark of vernacular architecture in repair.